Not far from Twin Arrows along I-40 (historic Route 66) and 30 miles east of Flagstaff, sits an eerie ghost town called Two Guns. This tiny place was a popular location for travelers to stop by because it had everything they needed for their journeys. The person who had the earliest business there was Ed Randolph. He built his store near where the Apache Death Cave (my next post) is located. In 1922, he sold 320 acres to a couple would construct a store, restaurant and gas pumps. Three years later, a man named Harry Miller rented some of the land from the couple. He saw the potential to exploit the location and the gorgeous Canyon Diablo scenery for his business ideas. Alongside the canyon he constructed a zoo with mountain lions, cougars, Gila monsters, snakes, birds and a lynx. He added a restaurant and Indian gift shop where he sold relics from the Apache Death Cave. For all who were interested and for a small charge, he would offer tours of the cave and present drinks near the entrance. He called his institution “Fort Two Guns”. 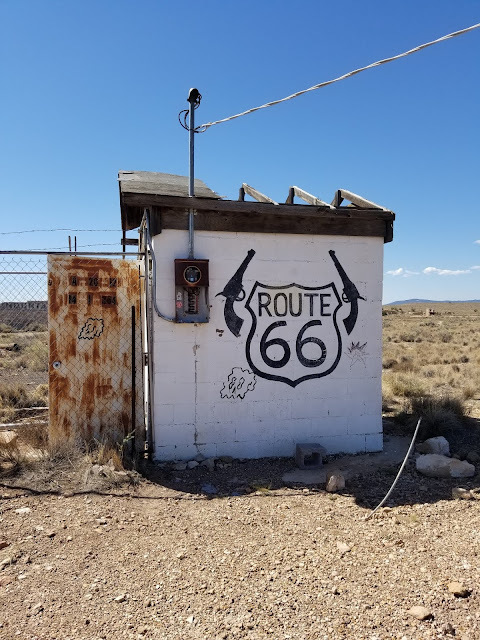 In 1926, US Route 66 became the name of the new highway After a terrible fight between Miller and the land owner; Miller killed the man, but was eventually cleared of his murder. Four years later, Miller left Two Guns after his store’s inner core caught fire. The land owner’s widow had another store built as well as the Two Guns Texaco gas station. Years later, a bridge was added across Canyon Diablo. After that a more updated gas station, motel, KOa campground, and new zoo were inserted. After the gas station burned down in 1971, Two Guns started to deteriorate. Many say the town was cursed being built on top of the Apache Death Caves. The town had difficulty keeping a sheriff for more than two days. Nowadays, all you will see of Two Guns is skeletal remains of the trading post, campground, cottages, zoo, and gas station. It is an amazing place to photograph especially those who love to take pictures of abandoned/historical sites.